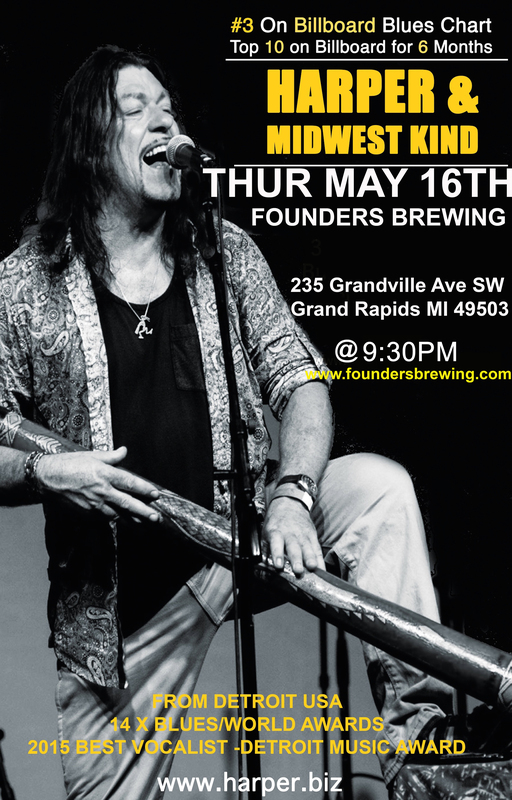 Harper and Midwest Kind - Founders Brewing Co.
An amalgamation of blues, soul and world music, Australian singer/ songwriter “Peter D. Harper” now based in Detroit, creates a heady mix of roots music through his creative use of the harmonica, and the haunting drone of the didgeridoo. Harper possesses a powerful soulful voice and a deep, almost mystical approach to music that some might say has evolved into its own genre. Harper calls it “World Blues” — a rich musical stew of ‘50s rhythm and blues, a ‘60s message of love and unity, and ‘70s funky soul, stirred up with masterful virtuoso harmonica and the deep, woody, percussive tones of the didgeridoo, served up in a feast of timeless mystery. Are you old enough for this adventure? © 2019 Founders Brewing Co. | Brewed for Us.